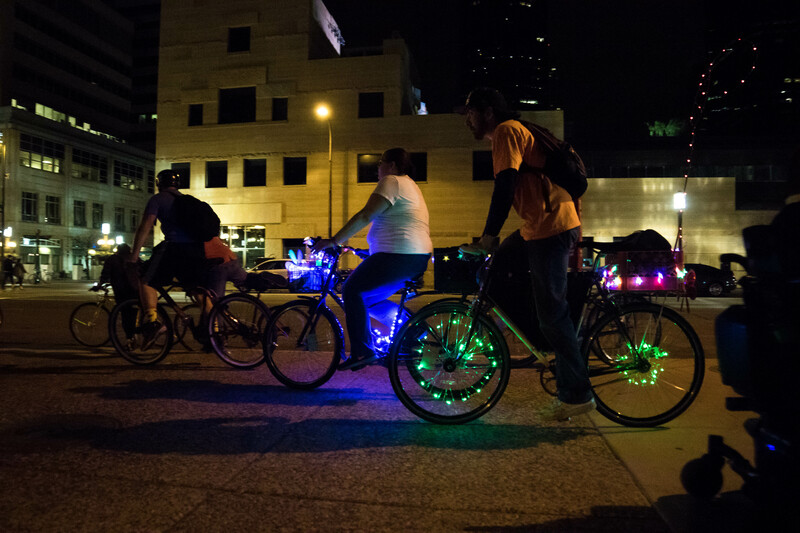 Bike Tour, Peavy Plaza, Northern Spark 2015. Photo: Shawn Orton. This year’s Northern Spark takes place entirely in downtown Minneapolis at the Minneapolis Central Library, Nicollet Mall and The Commons park. Travel to the festival by train, bus, bike, or foot and then walk or bike between venues. Ride Metro Transit free to Northern Spark! Download a free pass for each night here. Festival venues are near multiple Metro Transit lines. The nearest Light Rail stations are Nicollet Mall Station (Blue Line) and U.S. Bank Stadium (Blue and Green Lines). Multiple bus lines stop along Nicollet Mall. The entire festival takes place inside Metro Transit’s Downtown Zone. Bus and train travel in this area is $0.50/ride. Learn more here. PLEASE NOTE: Metro Blue Line will be down for service the weekend of Northern Spark. Free shuttles will replace Blue Line trains. Metro routes end at varying times. Regular fares apply, unless you download a free pass or take a Blue Line shuttle. Bicycling is a great way to travel to and between festival sites. Don’t forget a bike lock, light, and helmet! Find permanent bike racks at the Minneapolis Central Library and along Nicollet. Temporary bike racks are on Portland Ave at The Commons. All bikes must be removed from temporary racks by 2 am each festival night. Find Nice Ride stations near downtown Minneapolis at niceridemn.org. Portland Ave between 4th and 5th Streets will be closed to traffic from 6pm to 3am on June 15 and June 16 for festival activities.